New disposable or durable products or applications that use nonwovens as a major component. Advances in web forming technologies. Advances in converting or bonding technologies. Raw material advances that provide enhanced value to nonwovens: examples might include new fiber, resin, finishing, or additive technology. Innovation in manufacturing including inline monitoring and sensing or advanced process control. Have been introduced to the market, or to the trade, within the 24 months preceding the event date. Finalists must agree to present their product in person at the RISE® Conference and to provide a digital 300 dpi/1MB high resolution image of their product for promotional purposes. The Technical Advisory Board (TAB) of INDA will choose finalists that, in their view, exemplify the use of cutting-edge science and engineering principles to advance the field of nonwovens. If TAB determines that a product or technology nominated for RISE® Innovation Award is better suited for an alternate INDA Award (e.g., HYGIENIX Innovation Award™) TAB will remove the candidate from the list of nominations and submit it for consideration in the applicable award category. Finalists will present their innovation to the industry at the RISE® Conference. Voting shall be weighted equally across three voting bodies: (1) INDA’s Technical Advisory Board (TAB), (2) the affiliated Conference Committee and (3) the respective registered Conference attendees. Each group shall vote separately and be given equal weight in the final determination of the award winner. Once the weighted votes have been tabulated onsite, the winner will be announced during the scheduled conference hours. INDA's Technical Advisory Board (TAB), consisting of INDA's President and Technical Director plus industry members with a technical background, shall first select the award finalists from all submissions and then vote on the finalist that best embodies the award criteria. Product scores will be the percentage of TAB votes obtained carried out to two (2) decimal places. INDA personnel will vote on which products make the Finalist category, but not on which shall be the winner of the Award. This will be one-third of the total score for a product finalist. The Conference Committee, consisting of an INDA staff coordinator and industry members from the market segment of the conference, shall vote on the finalist. Product scores will be the percentage of Committee votes obtained carried out to two (2) decimal places. This will be one-third of the total score for a product finalist. TAB Members on the Conference Committee shall vote only once and INDA staff shall not vote. The Conference attendees who register and receive a ballot as part of their registration fee shall vote for the finalist. Product scores will be the percentage of the attendee votes obtained carried out to two (2) decimal places. This will be one-third of the total score for a product finalist. TAB members and Conference Committee members shall vote only once either in their specified group or as an attendee. The winning finalist shall be determined by totaling the voting percentages from the three voting groups and announced during the scheduled conference hours. Each company whose products are nominated shall indemnify, defend, and hold harmless INDA, its directors, officers, members, employees, and agents, and all other individuals involved in the voting process from and against any and all claims, actions, judgments, demands, liabilities, losses, injuries, costs and expenses arising out of or relating to such company’s products, including the manufacturing, packaging, labeling, advertising, sale, and use of such products. Categories and rules are based upon the interpretation of the Technical Advisory Board. DiviDiaper prevents/reduces both infant and Incontinence-associated dermatitis in adults, Urinary Tract Infections (UTI), Catheter-Associated Urinary Tract Infections (CAUTI), Candida/yeast/fungal and other genital infections and pressure sores. It has been recognized by medical staff and diaper industry leaders as an invaluable innovation. The RISE® Innovation Award was presented to PurPod100™ Compostable Pods made by Club Coffee LP for their certified 100 percent compostable pod for the single-serve coffee process. "We are truly honored to receive this year's RISE® Innovation Award. Millions of consumers are enjoying a great cup of coffee "guilt-free" in our 100% compostable PurPod100™ format every day, and we are proud to see industry experts recognize the sustainable nonwoven filter innovation that makes every cup possible," said Claudio Gemmiti, Senior VP of Innovation and Strategic Growth at Club Coffee L.P.
Fibrella Lite is an example of the innovative application of technology allowing the matching of traditionally incompatible nonwoven features like softness, strength and lightweight together in one material, according to the company. Fibrella Lite nonwovens meet the exacting requirements for a light yet stretchable material with strength and elongation properties required in laminates for absorbent hygiene products in baby care and adult incontinence applications. Fitesa, Braskem and NatureWorks engineers have worked together to produce a new performance nonwoven product composed of not one, but two biobased polymers in a sheath-core, bicomponent configuration. The sheath is made of Braskem's I'm green™ 100% biobased polyethylene while the core uses NatureWorks' 100% biobased Ingeo polylactide. The resultant nonwoven is extremely soft, thanks to the bio-PE outer sheath, yet remains strong and robust due to the Ingeo core. EcoCradle is a packaging material that is produced using mycelium, a fungal network of threadlike cells. This mycelium grows around agricultural by-products like buckwheat husks, oat hulls, or cotton burrs to any shape we make. In 5 – 7 days, in the dark, with no watering, and no petrochemical inputs, the mycelium envelops the by-products, binding them into a strong and beautiful packaging part. Inside every cubic inch of EcoCradle, there's a matrix of 8 miles of tiny mycelial fibers! New Aptra Elements™ is a metallic, highly reflective, breathable, air barrier membrane. Made of durable, UV stabilized polypropylene and nonwoven; the advanced material maintains strength and flexibility without metal surface rub-off or oxidation and can be used for multiple uses within the building, architecture, construction, marine, tent, and upholstery industries. Congratulations to the 2018 RISE® Innovation Award winner, DiviDiaper! 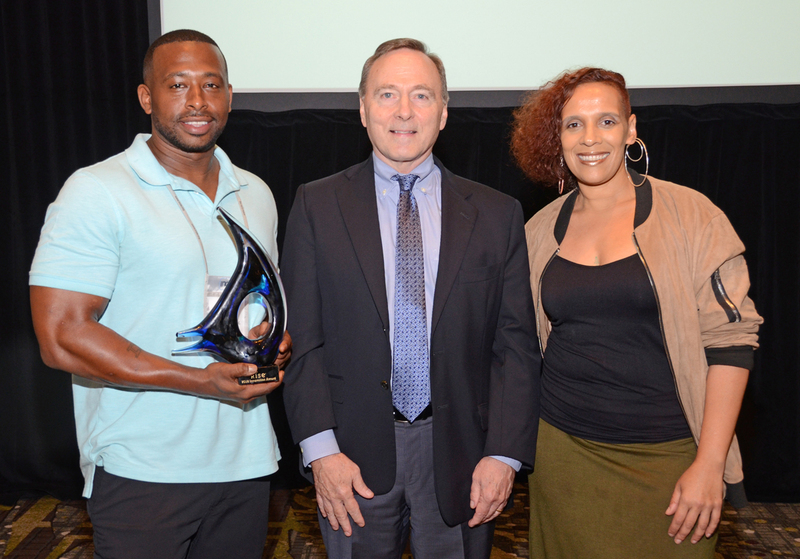 Dave Rousse, INDA President presented the award to Tivon Jeffers, Inventor & CEO, and LisaRozanne Walters-Jeffers, Vice-President & General Counsel DiviDiaper, Inc.